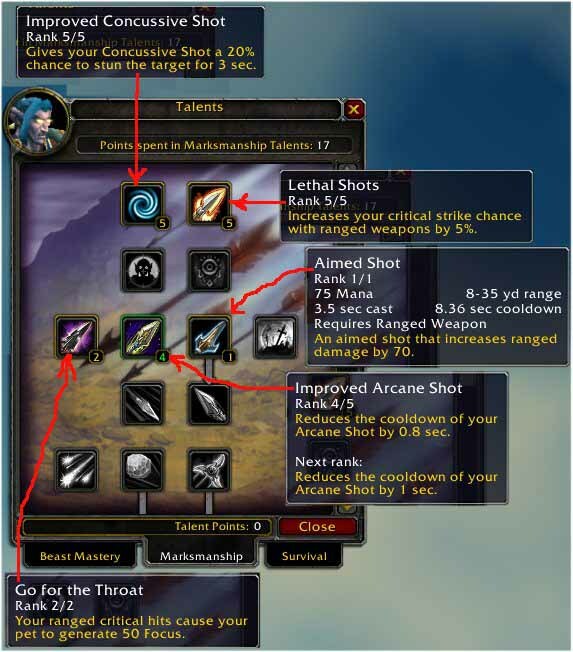 If you are a "newbie" to World of Warcraft, and want a helpful walkthrough for the first two weeks of play and set your expectations as to how you are progressing in the game vs. an average player (that would be me), and learn a few tricks that *ALL* the advanced players figured out which make the game more fun and less frustrating. Who is Brianw, and What Does He Know? I am a 39 year old software engineer living in the San Francisco area, and I have a few friends who play World of Warcraft. 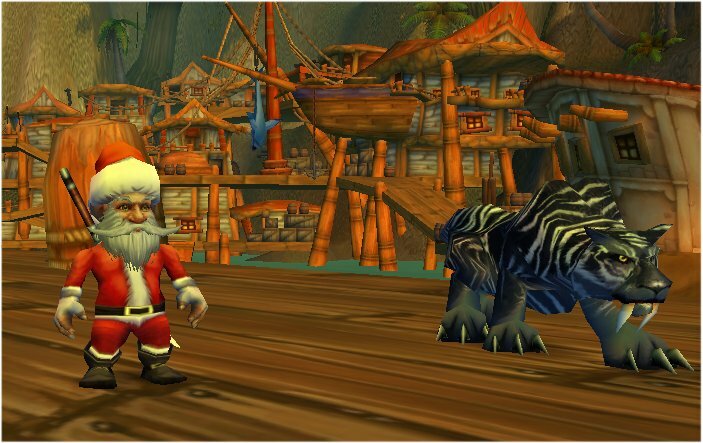 Here is a link to Casey's WoW (World of Warcraft) page. My friends enjoy the game, so I wanted to give it a try. I don't play many RPG (Role Playing Games), but sometimes I play shoot-'em-up video games like Quake and Battlefield. For the record, I don't know ANYTHING about World of Warcraft, I had never played before 2 weeks ago. So help me out and please email me any corrections or suggestions or comments and I'll add them to this page. Thanks! My in-game character name is Brianw, and I play on the Spirestone server. Time: This phase takes 1 hour. There are just three things you need to do before you start playing. The first is that you need to install WoW (duh :-). The second is that you need to read *ONLY* chapters 1, 2, 3, 4 of the manual that comes with the game (this will take 30 minutes). And the third and final thing is that you need to print out these maps of the entire WoW "world": Kalimdor Map, Eastern Continents Map. (This is *EXPECTED* and *NECESSARY* to have the maps -> the game designers put small, cheap, non-color versions on page 150 of your manual, but nobody reads that far before playing so you don't realize it.) If you have trouble or can't read the maps you just printed out, print the following 4 documents at 100 percent scale and tape them together, they are made for exactly printer size: KalimdorTop, KalimdorBottom, EasternContinentsTop, EasternContinentsBottom. There are many other great maps available on the internet, these are just some I found that I liked, and I modified and annotated them with stuff you will need right away. Start the game, and to have this guide make any sense, you MUST choose "PvP" (Player vs. Player, don't worry, you never have to fight other players unless you want to), and choose to be a "Hunter" as your class, and choose to be a "Night Elf" as your race, and "Alliance" as your faction. This set of decisions is mentioned in the manual on page 14. There are a LOT of bad decisions possible here and very few good ones, if you want to use this walk-through guide, you have to pick this highly recommended combination. If you don't choose these, the rest of this guide won't make much sense. Goals: This is a basic tutorial phase, figure out basic game play, advance first few levels, discover small town of Dolanaar. Expectation Setting: All about basic game navigation and play, all game play is "Solo" (no collaboration, you will not even see or meet other players). Map Location: East half of Island of "Teldrassil" at very top of Kalimdor Map. Time: This phase should take you around 2 - 5 hours of online game time. As is detailed in the manual in chapters 1, 2, 3, 4 (and first 3 pages of chapter 5) you collect "quests" and complete them, gain a few experience, and you will progress up the first few levels. IF YOU ARE A NIGHT ELF, you start on the maps at the very top of Kalimdor Map on the island up there, and during this phase you probably won't make it out of the eastern half. Around level 5 you should be in or around the town of Dolanaar. If you have started someplace else, you are not a night elf, and the rest of this guide will make less and less sense. The game starts and progresses by you wandering down one main path (the only path). Don't stray too far from the path, kind of progress along it. Use the "m" key to see a big map of where you are. The further west you go across the island the higher your level should be. The "PrintScreen" button takes a snapshot and puts it in "C:\Program Files\World of Warcraft\Screenshots". I would recommend each time right after you accept a Quest, hit "m" to see the map of where you are, hit "PrintScreen" to snapshot it, and then you can always find your way exactly back to the character who gave you the quest. You don't need to finish all the quests in any area, but you know you are moving too fast if the monsters you encounter are a higher level than you are and kill you too often. You are offered "trades" to learn, such as "cooking", "fishing", "tailoring", etc. Only first aid is worth knowing, the rest are all extremely boring ways to earn in-game gold at a very slow rate and do NOT help you further your character in the game. Don't waste any time with any trades right now, the monsters all drop a few copper pieces when you kill them, just collect those. Expectation Setting: Explore much of Island of Teldrassil, but will not leave island, all game play is still "Solo". Map Location:: Whole Island of "Teldrassil" at very top of Kalimdor Map. Time: This phase should take you around 10 hours of online game time. It is now time to read chapters 5, 6, 7 in the manual. Skip anything about "Pets", you can't have a pet until you are level 10. Skip "chat logs", there will be nobody to chat to for several more levels. Skip macros, you won't use them for months. Every advanced player on earth is using CTMod, which is a collection of trusted and widely used "mods" that extend the GUI to fix several horrible, HORRIBLE shortcomings in the game. I'm not kidding, you MUST install this, it isn't optional, you might as well uninstall WoW right now without this. At very least install "CT_Core", and "CT_BuffMod". Until you are ready to use the mods, they won't get in your way or make it more complex to play the game, just easier and much less frustration. You should get the latest version frm http://www.ctmod.net but here is a link to "CT Mod 2 version 8" which I was using a long long time ago on 12/30/06. Every advanced player on earth is using the website Thottbot to complete their quests. Mainly, to find the objective of the quests, type in the quest name into the Thottbot homepage, and then look for the coordinates of the objective (these will look like "54,10"). If you pop up the local map using the "m" key, notice that after CTMod is installed you now see your pointer coordinates and character s coordinates listed in the upper left corner of the map -> armed with this information you should NEVER spend any useless, soul-destroying time wandering around searching for a person or a monster. There is no part of the game of World of Warcraft which is about being lost or walking in a careful search pattern for 5 hours looking for one item. That is not why anybody plays. Just use Thottbot and CTMod like the rest of us. Any single monster you encounter should take 15 - 30 seconds to kill. The ideal monster is 2 levels lower than you, because they take the least amount of time to kill and almost return as many experience points (XP) as monsters your level or higher. In this phase, you should be doing web searches on Thottbot for every quest, and completing them more and more quickly. You should reach the town of Darnassus around the time you reach level 7 or 8. When CTMod is installed, the level of difficulty of the quest is displayed in the Quest Log. DO NOT bang your head against quests that are too hard for you at your current level. Instead, rise up a level or two then go back and knock the quests off quickly. There is a map of the town of Darnassus in your manual. The two most important things to find are the PostOffice to exchange in-game mail with other players and also receive packages that you purchase like in-game gold and weapons (found next to the Bank at the center little mini-island in "Lake District"), and your "Hunter Trainer" who is found in the Cenarian Enclave. There are guards wandering around that will direct you to places like this by marking a spot on your "m" map of what you are looking for. PLEASE SEND BRIANW 1 copper piece if you are on the Spirestone server and read this webpage!! :-) I would appreciate hearing from you, it is good practice for in-game post-office mail, and I'll know that you actually read this webpage. If you are not on Spirestone, please send me an email here: . Trainers - you need to visit your "Hunter Trainer" every 2 levels and train up on everything that is possible to train on (displayed in green in a list). EVERYTHING, there are no tradeoffs, just train on everything. You can only use leather armor until level 40, so sell all mail armor back to the merchants so it doesn't clutter your inventory. Make the Inn at Darnassus your home, so that you can use the Hearthstone to teleport right back at any moment to complete quests, sell items, repair your weapons, etc. Map Location: Island of "Teldrassil" at very top of Kalimdor Map, travel to Auberdine on Kalimdor Mainland. Time: This phase should take you around 15 hours of online game time. The very first thing to do here as soon as you can is go to http://www.belrion.com and purchase 100 in-game gold pieces for about $10 US dollars. The in-game gold will arrive into your in-game post-office mailbox which you can find in Darnassus next to the bank. This will last you until about level 40 or 50, and free you from a very VERY annoying and time consuming part of the game where you would have spent 20 or 30 hours "fishing" and selling the fish in Darnassus, or possibly "mining" or "picking flowers". This behavior of learning a trade and grinding yourself into the ground doing the trade to generate dollars doesn't make your character better in ANY WAY, it just wastes your time. However, if you cannot afford the $10 US dollars (or are opposed to it for other reasons), plan on making less than 1 in-game gold per hour at your trade, so you will be saving about 10 cents per hour by working the grind in the game!!! NOTE ON GOLD FARMING CONTROVERSY: I have found out this piece of advice generates some strong opinions, I don't care if you purchase in-game gold or not, it is your personal choice. I include it here as a note on the FASTEST way to level your character. For more info and related links on gold farming, click here. At level 10, you can get a pet. Read the manual again for how to operate your pet, and follow the in-game quests to acquire and teach you about your pet. I chose to tame a cat (any level cat becomes the same "tamed cat", so you don't need to worry about taming the highest level toughest cat). Send your pet in to engage the monster, distracting it and taking all the damage. Mark the monster with your "Hunter's Mark" which increases damage. Continue to auto-shoot arrows into the monster until dead. If your Arcane shot recharges and is available before the monster is dead, fire it again. Every two of your levels visit three trainers and train on EVERYTHING they offer: 1) Hunter Trainer, 2) Weapons Trainer, 3) Pet Trainer, and 4) in your "Spells" there is a "Beast Training" you should also visit and train on everything. If you do not do this, you are not getting the more powerful weapons and you will fall behind in the game. About level 12, the game will explain how to leave Darnassus and go to the mainland. But here is how you do it -> there is a portal behind the bank that you walk into and transport to the town of Rutheran Village (still on the island). 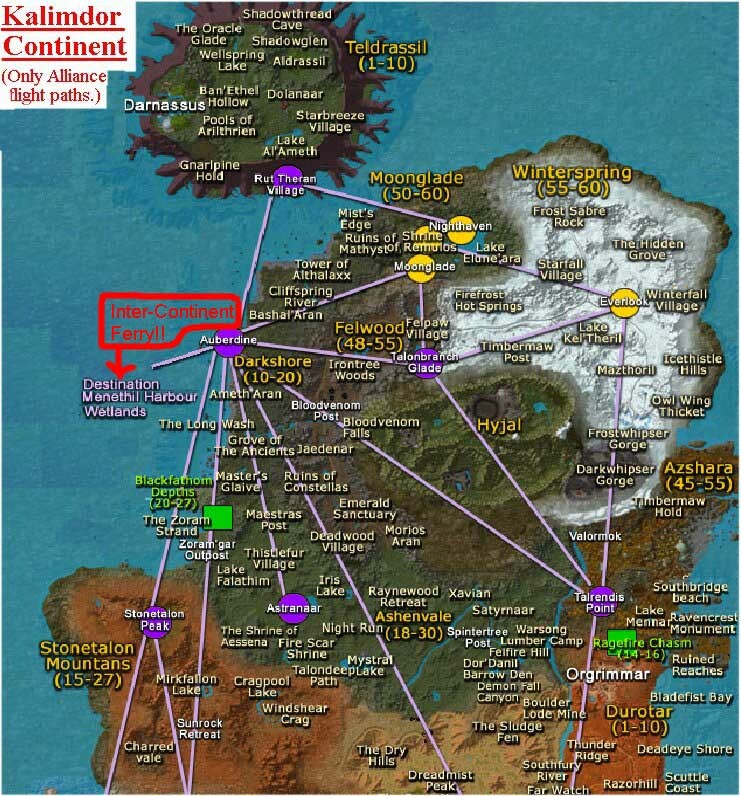 Once there, you can take a Gryphon or Ferry to the mainland and go to the town of Auberdine (in the zone of "Darkshore", on the continent of "Kalimdor"). You cannot swim to the mainland, you get about 15 minutes out and drown. Once you make it to Auberdine make that your home Inn, you will be hanging out here for a while. Map Location: Zone of "Darkshore" around the town of "Auberdine" near the top of Kalimdor Map. LOOK AT THE MAP: Kalimdor. Notice the purple lines? Those show you the possible flight paths of the Gryphons, AS LONG AS YOU TALK TO A GRYPHON MASTER!!! So whenever you slowly walk all the way to a town with a Gryphon master (you can know this by reading the map Kalimdor) if you walk up and talk to the Gryphon master it will "connect you" forever to this town and you won't have to slowly walk there again. Don't worry about the price of the flights, it is always very small and you purchased enough gold to last you until level 40 or 50 anyway. LOOK AT THE MAP: Kalimdor. Notice the number in parenthesis like under the word "Darkshore" it says "(10 - 20)". That is the level of the monsters you can expect in that area, and also the level that YOUR CHARACTER needs to be to hang out and fight there. Remember, the best monsters to kill are exactly one or two down from your current level. That gets you the most experience in the least amount of time. Banging your head against larger monsters is a waste of time -> go level up then come back when you are powerful enough to easily complete the quest. Every monster should take about 10 - 20 seconds to kill at this point and it should go smoothly. You can *ONLY* travel between Kalimdor and Eastern Continents by ferry, no gryphon is available. 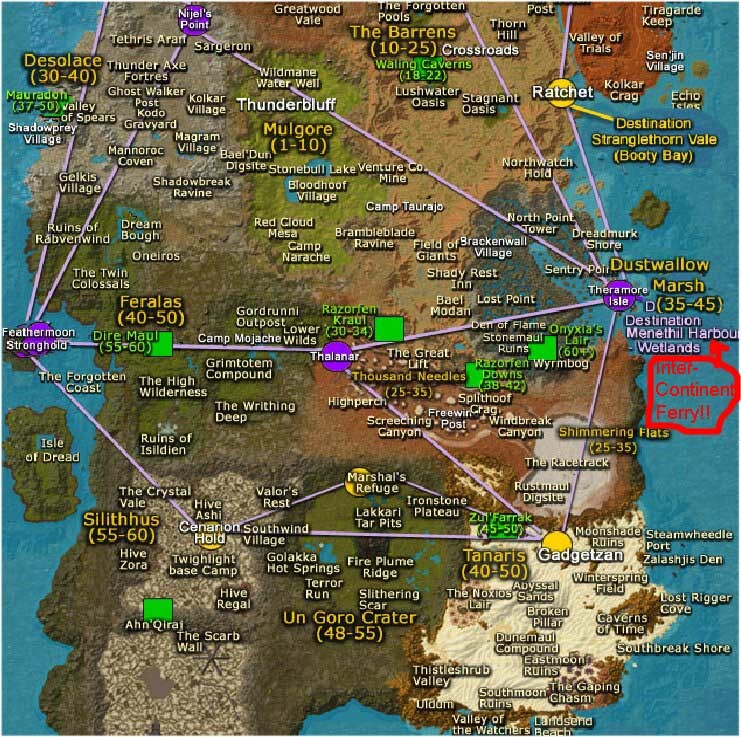 The *ONLY* place you will ever travel between is Auberdine in Kalimdor, and Menethil Harbor in Eastern Continents. These are marked on those maps in big red rough circles and say "Inter-continent Travel" in red. About level 12, you should start visiting the auction house. At the auction house you should never "bid", just use the "buyout" button if the price is acceptable and instantly buy the items (which appear in your in-game post-office mailbox). The prices are better than the venders, and there is better selection (better weapons, better armor, etc). Since you bought the in-game gold, you have a pretty much infinite supply of in-game gold to purchase the very best equipment of every kind until level 40 or 50. Expectation Setting: More fun, meet other players. Map Location: Eastern Continents namely the zone of "Dun Morogh" which contains town of "IronForge" and the zone of "Elwynn Forest" which contains the town of "Stormwind". Time: This phase should take you around 30 - 40 hours of online game time. During this phase, you should start exploring and finding all the Gryphon masters. A very good goal would be to walk down the roads and make it all the way to the huge town of Ironforge by the time you are level 19, which is very neat and found in the Eastern Continents. There is an underground tram that is completely safe that takes you between Ironforge and Stormwind city, take it. Find the Gryphon master so you can fly around quickly. 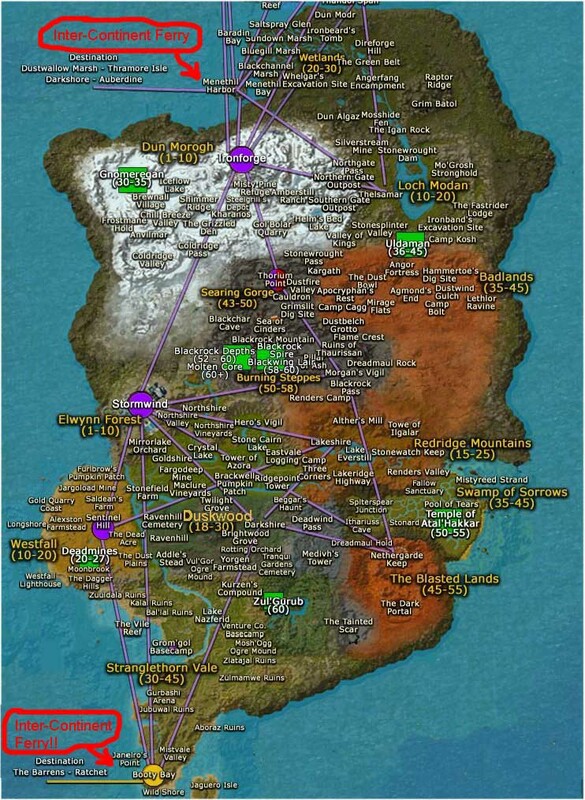 Now you can pick the areas marked on the maps of Kalimdor and Eastern Continents that correspond to your current level (notice the numbers in parenthesis on those maps) and go there and solve quests. There is a scroll called "Heavy Armor Kit" that "reinforces" armor of the chest, hands, boots, or legs of level 16 by +24 armor points. Find it at the auction house and always have it applied to everything that it can be (it is permanent when applied once) so you are tougher. Use one scroll per piece of armor, and bundles of 4 of these scrolls costs less than 1 gold piece at the auction house (that is 1 US cent!!) so it is very very worth it. For items higher than level 25 and higher, there is a "Thick Armor Kit" that boosts even further to +32. There is also a "Rugged Armor Kit" for level 40 and higher characters. This is a "reasonable build out", not the very best equipment but a reasonable set at level 26 and 2 weeks of game play. 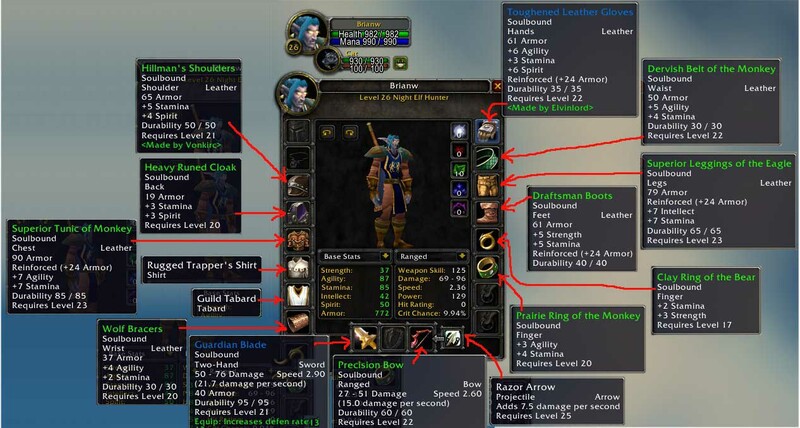 If you do not have this approximate setup, you should visit the "Auction House" and buy up to this level of armor. All of what you see outfitted above will cost you about 15 gold, which is about one US dollar when purchased from Belrion. By the way, this gear all lasted me until level 32 without a single swap out, so level 26 is an EXCELLENT time to gear up to the build out above. 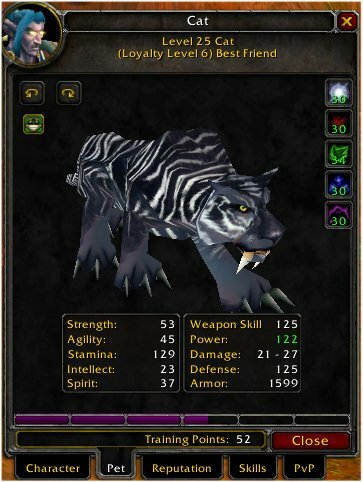 Here is BrianW's pet at Level 26. 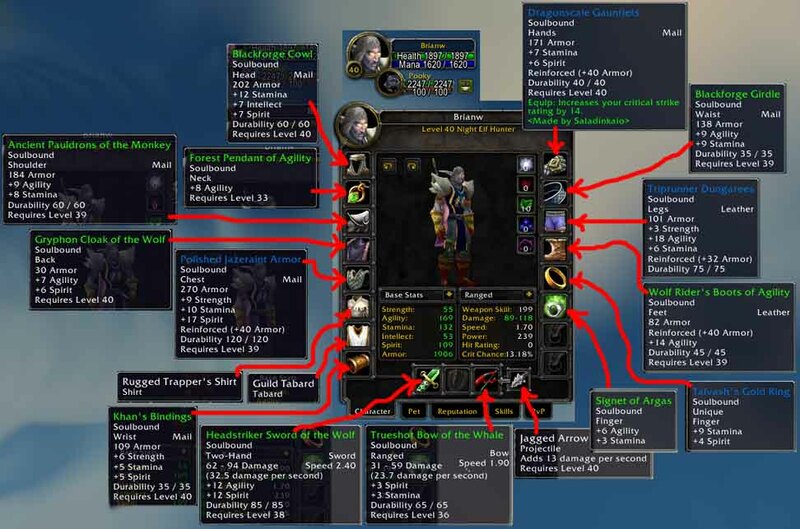 Below is a snapshot showing how I lay out my toolbars, and what is in my backpack and bags when I go out on a quest. (You can store extra stuff you are not using at the bank.) Notice the big red labels I called out some important stuff on the screenshot, like the fact that meat is GREAT because you can both eat it to restore your own health, and also feed it to your pet, so it saves on space in the bags. Before leaving the city, I always outfit the stuff below from stores and the auction house -> NONE of this stuff is from quests, you just buy it and use it all up. *ALWAYS* use "Sweet Nectar" to restore your Mana, and *ALWAYS* eat "Wild Hog Shank" to restore health. This stuff is very cheap, and your time should not be spent sitting quietly on the ground waiting for regeneration. Then use the emergency potions if you are in a fire-fight with a monster. Just to keep notes on where I am, it is taking me about 5 hours of game play for each level. Some go faster than others, based on what quests I do and how much I try to explore the map over my current ability. 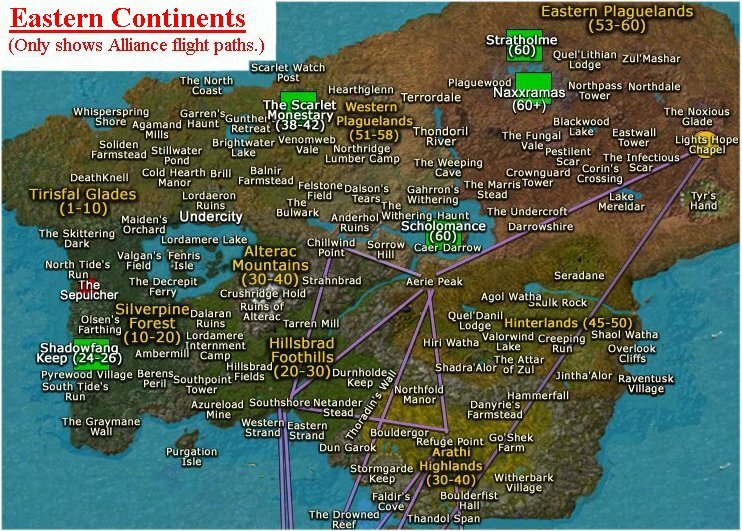 At this point I have uncovered almost all Gryphon flight paths and launch points all over the map. I have STILL never completed an "instance", although I almost solo'ed "Deadmines", I didn't quite make it. I level entirely solo, I don't know anybody that is my same level. Additional NOTE on running out of gold -> I just ran out of gold, so bought 100 more from Belrion. This has allowed me to never pick up stuff that wasn't related to any quests (which normally you would sell) which EASILY meant passing up 20 or 30 gold in the interests of time and effort. Also, I bought a couple bigger bags (16 slots) for 8 gold each (didn't worry about shopping around). Also, I always consume extra mana/health anytime I could possibly need it instead of just sitting down and waiting for it to repair (which would be cheaper). Also I go out "buffed" on most quests with scrolls and potions, I have never worried one single whit about spending gold. Additional NOTE on weapons/armor -> my weapons and armor above at level 26 lasted me until level 32 without any changes. At level 32 I bought a helmet for the first time (80 armor) for about 5 gold. I also "upgraded" every weapon and armor I could, and got about a 10 percent boost in all the armor and weapons (very incremental, barely worth doing) for a total of 5 gold. 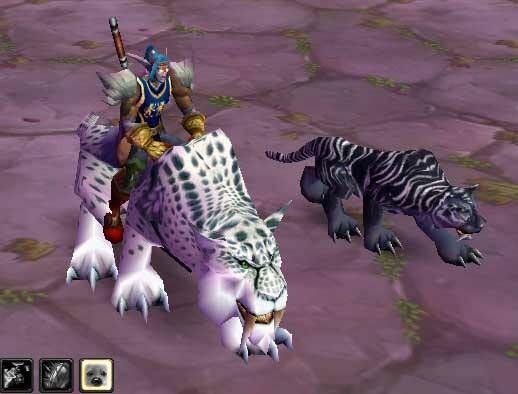 Immediately go find something to fight and fight it standing along side the pet (Ghostpaw Alpha). Watch very closely, and in the General Log within 1 or 2 fights it will say something like "You have learned a new skill: BITE". This took less than 30 seconds of fighting to see!! I don't know if this was necessary, but I took my new pet (Ghostpaw Alpha) back to the stable, bought it a new "Slot" to park it in, parked it. Got original pet (cat) back out of the stable, took it to the "Pet Trainer" which is always right near the stable and "Untrained All Skills" for about 30 silver. Go to "Spells and Abilities" -> "General" (first tab) -> click on "Beast Training" -> notice EVERYTHING is green and also that you have the "BITE Rank 4" available. Train on almost everything (I ran out of pet talent points just 1 skill shy of everything possible). Now your pet toolbar should have "Bite" in it -> if not, find that ability and drag it onto the toolbar. Now repeat steps 1 - 6 for "Claw Level 4" which I choose a "Elder Ashenvale Bear" from This Table of Pet Abilities (Rank 4, column "Claw"). I hit level 40 today which is a very important level. First of all, you can use "Mail" armor for the first time at level 40, so I spent about 20 gold in the auction house almost tripling my armor protection instantly. Second of all, you can use a "mount" for the first time at level 40. At this point, this is a graphical snapshot of the BrianW level 40 character including his current armor and equipment. Everything you see below was bought at the auction house for about 20 gold total (sometimes you have to wait a day or two for the "good stuff" to appear, so be sure to visit the auction house several times). Remember to apply the "Rugged Armor Kit" scroll to all pieces of armor you can. The scroll is found in the auction house for about 1 gold, and then provides +40 armor to whatever it is applied to. FIRST AID AS A SKILL/TRADE and WALKTHROUGH - As mentioned before, the only useful "trade" is First Aid. At this point I was topped out making "Silk Bandages" with a maximum of 150 skills points (open your character pane, click on "Skills", then notice under "Secondary Skills" if you have trained on it there is a "First Aid" skill which says something like "150/150"). I got a tip from some other players to purchase some books from a COMPLETELY out of the way vendor nobody would ever find to increase my first aid level. The vendor is hidden in the zone of "Arathi Highlands" Eastern Continents, in the Stromgarde Keep. I heard you could also purchase the 3 books (at an increased price) in the Auction House. The books are titled "Expert First Aid - Under Wraps" and requires you are already first aid with 125 skill points. The other two books are "Manual: Heavy Silk Bandages" and "Manual: Mageweave Bandages". Use the first book, and ***NOW*** your first aid max rises to 225. Create some more silk bandages and it starts going up (about 1 skill point for ever 2 bandages). Once it passes 180, read the next book, create more silk bandages (now "Heavy Silk Bandages) and so on... You should have a hot bar fast action which is "Use Bandage" that you can use during a fight to heal yourself. FIRST AID AS A SKILL/TRADE and WALKTHROUGH - Artisan. 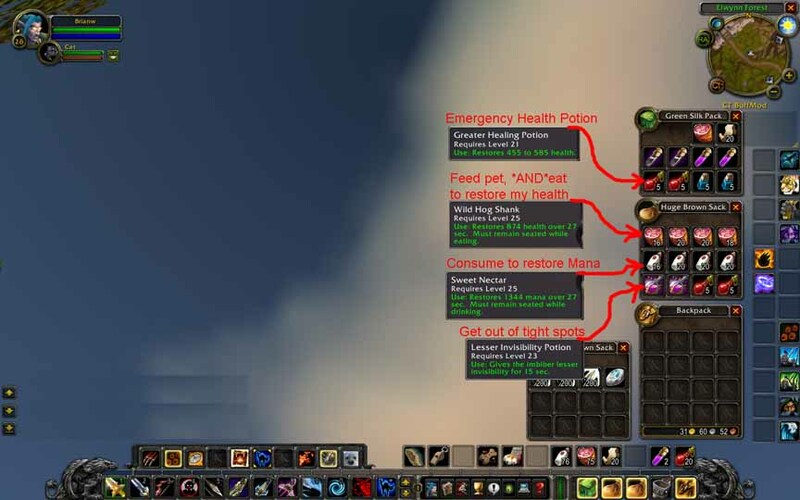 To get past "225 max skill points" in First Aid, I found this good webpage Great-World-Of-Warcraft-First-Aid-Explanation. The next step is "Artisan" to get up to 300 max skill, and requires player level 40 which I am at this very moment, so it seems you have to complete a quest called "Triage!". Use http://www.thottbot.com to figure out how to find this quest (pick it up from Nissa Firestone in Ironforge) and complete it. When I went to Nissa, she gave me the quest "Alliance Trauma", which took me to another NPC in Theramore Isle (in the Zone of "Dustwallow Marsh") who gave me the "Triage!" quest. It is a pretty easy quest, kind of a "whack-a-mole" game with patients in a hospital trying to save the ones that are dying first. After completing, your new max First Aid points are 300. Build it up to above 260 by creating Mageweave Bandages (a ton of 'em, like 100). Then GO BACK to the same doc in Theramore that gave you the quest and *HE* will teach you to create two more types of bandages. Whew!! Such complexity. The biggest type of bandage you can build at this point is "Runecloth", so now create a bunch of those to build up your skills to above 290, at which point you go back to that same doc in Theramore and he will teach you to create "Heavy Runecloth" which heals 2000 in 8 secs. Whew Whew Whew!!! You can always get the raw materials to create bandages from monster drops, or the auction house. PPL - People, as in "players"